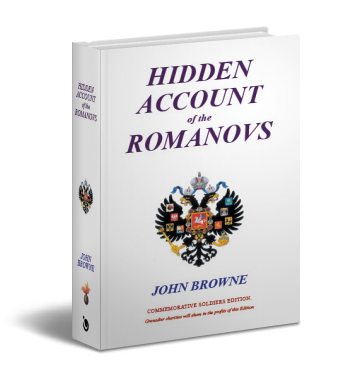 John Browne releases his novel, Hidden Account of the Romanovs—set in WWI and the Russian Civil War. Preparing for President Putin’s State Visit in 2003, The Bank of England is instructed to close any remaining Russian Imperial accounts. The Bank’s investigation follows a Grenadier officer’s career. Against a background of Imperial elegance, the story encompasses two of history’s greatest mysteries, the murder of the Russian Imperial Family and the Ml6-led plot to kill Rasputin. The book explores the causes of WWI; the true nature of Grenadier trench life with actions involving The Prince of Wales, Winston Churchill, and Christmas 1914; combat flying with 56 Squadron, Royal Flying Corps’; the imprisonment and murder of the Imperial family and examination of the DNA evidence; pressures on King George V causing him to delay rescuing his cousin Nicholas II; and the raising of Bolshevik seed money on Wall Street. Copyright © 2013. John Browne. All rights reserved.